Always look for luster first when selecting a Black Pearl. The luster or reflective surface shine is the highly mirror-like quality. The better the luster the higher the quality pearl, because the luster indicates a thick layering of pearl material or nacre. Usually this means the pearl has been in the oyster a long time. The thicker the pearl nacre, the better the pearl. Black Pearls come in a wide range of natural shapes ranging from pear-shaped, tear-drop, button, mushroom, acorn, barrel, and baroque shapes. All the shapes of black pearls are considered desirable and marketable. Often, the pear-shaped and baroque pearls are set in pendant designs, and the rounder pearls are used for rings and earrings. Round pearls are harder for the oyster to create and therefore they are more rare and more expensive. Tahitian Black Pearls come in a rainbow of beautiful natural colors. Each color is special, and each is sought after by collectors. The most important factor in selecting color is to determine which color looks best on the wearer. The colors comes alive on different skin tones and complexions. All pearls have an under-color ranging from pale silver to dark black. Often, there will also be a layering of iridescent hues in addition to the under color. These shimmering colors can be peach, copper, pink, sea green, turquoise blue, peacock green, burgundy and bordeaux, indigo and navy, purple and lavender to canary and cranberry to deep midnight black. 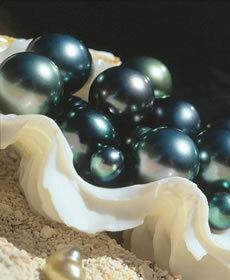 The value for Tahitian Black Pearls is evaluated based on rarity and perfection. Each pearl is graded individually. Several criteria are used to evaluate each pearl. They are: Luster, Size, Shape, Orient, Color, and Surface.